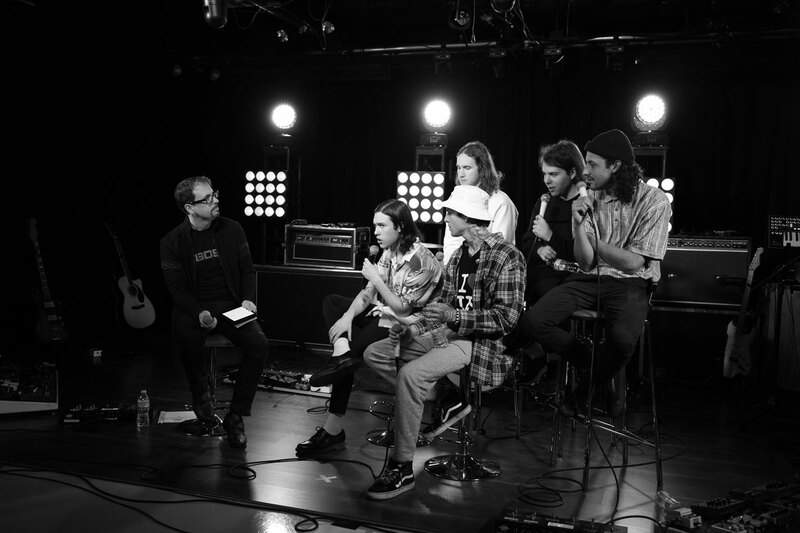 On January 28, 2016, Roland and BOSS artists The Neighbourhood performed live at Roland Sessions. 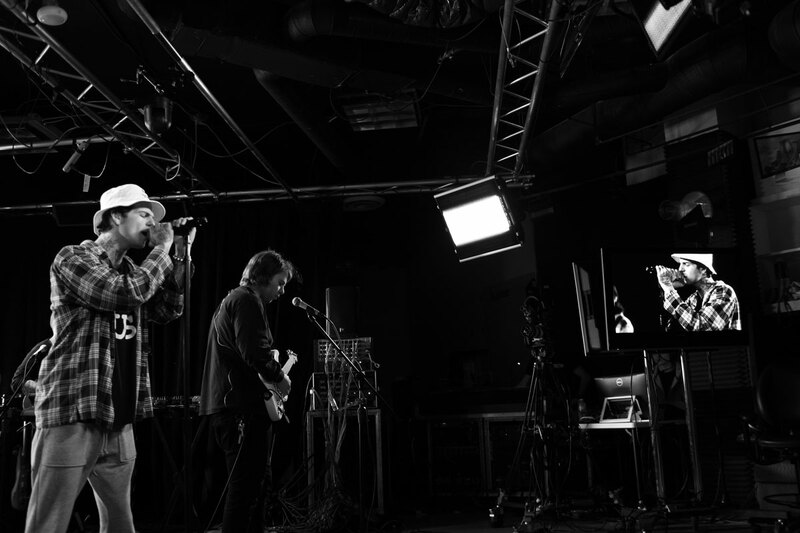 Streamed live on the web from the video studios at Roland headquarters in Los Angeles, the chart–topping alternative band performed a set of songs from their first two albums. After the performance, Roland and BOSS Product and Artist Relations Manager Gary Lenaire sat down with the entire band for an exclusive interview, where they talked about their recording process, influences, favorite Roland and BOSS gear, and more. Read on to see the performance and interview videos, plus an interview transcript and photos. Last August, you released Wiped Out! In what way is that record different from I Love You, the previous release? Jeremy Freedman (guitar): It took longer. Zach Abels (guitar): Yeah. [Laughs.] We put more time into it. You know, it’s the second time around, so we’ve gained some experience being a band, and kind of knowing a little bit more than we did the first time around. 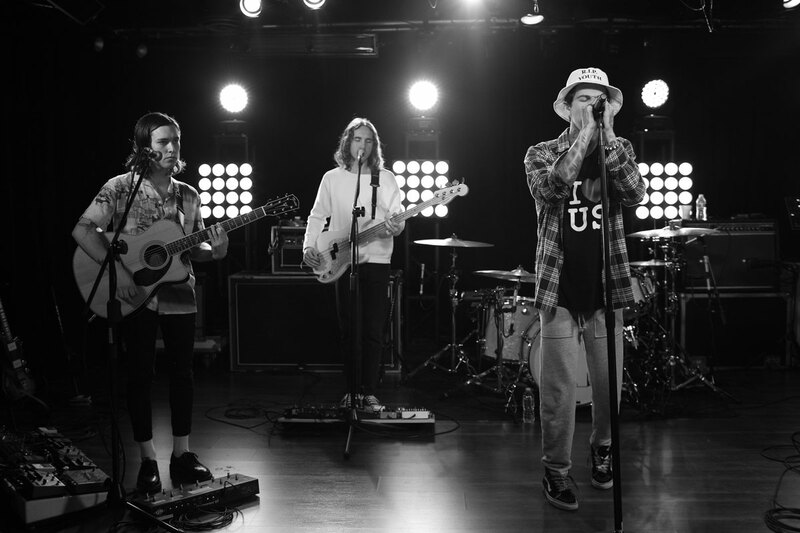 The Neighbourhood performing live at Roland Sessions. Did you experiment with new instruments? Brandon Fried (drums): Not instruments—maybe production and stuff. I didn’t feel like we used anything instrumental that was actually crazy. The slide guitar was something new that we used. Zach: We used a pedal steel and a [Fender] Bass VI. Describe the songwriting and arranging process and a normal day in the studio for you guys. Brandon: It’s not conventional all—it’s different almost every time. Especially on this record, there were so many different ways. It would just be like a vocal melody first, and then us writing music or production and going back and forth on that. Or like having a song idea and then doing lyrics. I feel like on this record particularly every song was arranged differently. It was never the same formula. It was always different. On a number of your songs, there are rhythms that have strong hip-hop roots. Where does that come from? Brandon: Hip-hop is something we all like. Mikey Margott (bass): That’s always been an influence of ours, and something that we’ve worked with since day one. Jesse, is it true that you originally wanted to be a professional wrestler? Do you think you can take Zach in a cage match? Jesse: No, I couldn’t take anyone in the band. They’re all handling me, no questions asked. You’ve cited artists like The Cardigans, NSYNC, and others as influences. Who are the current artists that you like to listen to? Zach: I’ve been listening to Timber Timbre, a really cool artist. Jesse: [Brandon] just showed me Anderson Paak. It’s really good music. I love Lil Wayne. He’s definitely one of my favorites. Mikey: Kendrick [Lamar] is the best out now, in my opinion. Last fall, you guys started touring with the new material. How did that go? Zach: It was cool. It was really fun. Jesse: The next tour we’re about to go on, I’m even more excited. [Before] it seemed like we were still learning a lot of [the songs]. Playing them in front of a crowd is a whole different thing that gets added into the equation. You’re doing some American dates, and then you’re off to Europe. Where are you going? Zach: We start in Russia, and we end in the UK. Brandon: The question is: where aren’t we going? I think we’re going everywhere you could possibly go to. We’re going to Ukraine, Czech Republic, Italy. Every nook and cranny I think of Europe. Mikey: I’m excited for Italy, because we haven’t gone yet. It should be a good time. Brandon: It’s ending at The Roundhouse in London, which is supposed to be a really, really cool venue. Roland and BOSS Product and Artist Relations Manager Gary Lenaire interviews The Neighbourhood at Roland Sessions. Let’s talk a little bit about gear. Jeremy, you use the JC-120 Jazz Chorus Amplifier. How does that fit into your rig? Jeremy: It takes pedals really well. I actually had more pedals than I have now if you can believe it. I had another pedalboard, and [our tour manager] Alex made me get rid of it. [Band laughs.] Going to Russia, it was going to cost way too much money. But the JC-120 just takes pedals I think better than most amps. It’s really nice. And it doesn’t sound like a solid-state amp. One of the pedals you’re using is the BOSS DM-2W analog delay. How is that working out for you? Jeremy: That is great for freak-out moments, like when [a song] goes wild. In the song “Wiped Out!” we have this really weird bridge, and I use that to have chaotic stuff going on. Mikey, you’re using the new ES-8 by BOSS, the effects switcher. Mikey: Yes. It’s a dream come true. It really is. It really works good. Playing live, or in any situation, being able to switch [multiple] pedals on, it’s great. Zach, you’re using a handful of BOSS pedals. You’ve got a compressor, delay, and you also have our tuner, of course. And you have two BOSS reverbs. How are you using them? Zach: For some songs, I put my reverb before my compressor so it’s like super splashy. And [then I put] a little cleaner reverb after [the compressor]. Brandon, you have the Roland SPD-SX Sampling Pad. How do you use that? Brandon: I use it for certain digital percussion parts that we have in songs. I use it to send a track to Jesse [and the band] for our [in-ears], it starts and ends the songs. I actually never used one before I joined this band, so the guys introduced me to it. But I’m pretty sure that I’ve have the same one since I joined the band two years ago. Jesse: That thing has run our show since we started. Zach: So many bands use it. Brandon: Your pedals are cool, but without the SPD, there’s no show. When I joined the band, I didn’t know about that whole world yet, because I was just playing drums in like garage bands. But when it comes to playing bigger shows, you have to run some of the tracks and some of the digital stuff. I’d never played to a click, and that whole world was daunting. I have to play in front of thousands of people and do this? But it’s turned out great, and I really do love it. It’s really easy, and it works very well. Where do your fans go to find out more information on your tours and the band? 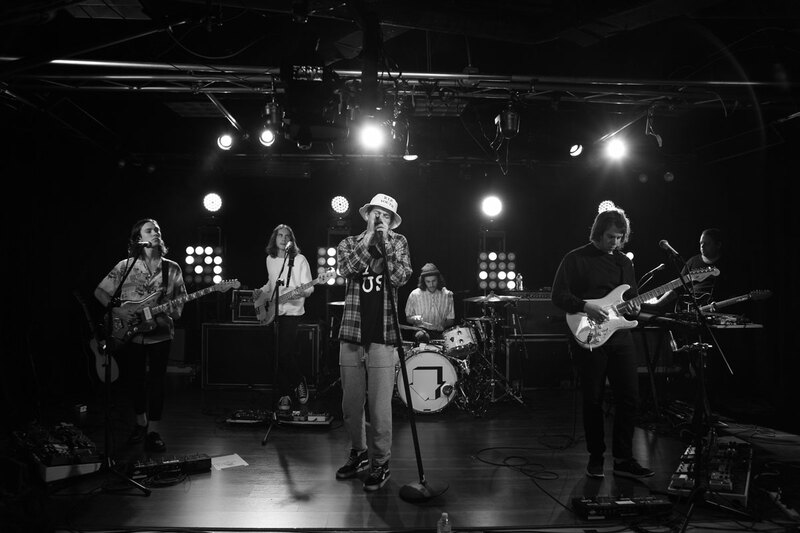 The Neighbourhood—also known as “NBHD”—formed in August 2011. Known for their seductive melodies, black-and-white images, and suburbia darkness, NBHD is lighting up the charts. The band is composed of vocalist Jesse Rutherford, guitarists Jeremy Freedman and Zach Abels, bassist Mikey Margott, and drummer Brandon Fried. In 2013, they released their first full-length album, I Love You, on Columbia Records. Their second album, Wiped Out!, topped the Billboard Alternative Album chart in 2015. Roland Sessions is a live music series presented by Roland U.S. Filmed at the video studios at Roland U.S. headquarters in Los Angeles, it features performances by leading Roland and BOSS artists. To view our growing performance archive, visit the Roland Sessions home page.